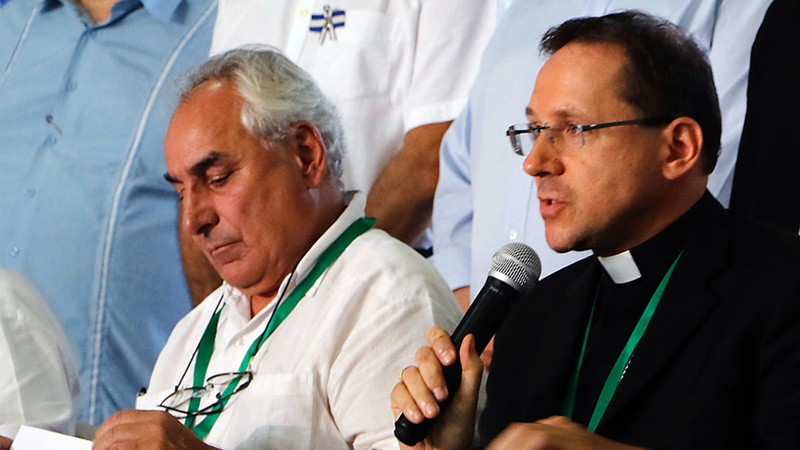 Nicaragua's Apostolic Nuncio Waldemar Sommertag speaks next to the OAS special envoy Luis Ángel Rosadilla during a news conference in Managua on Wednesday. They said the government had agreed to release detainees within 90 days. Mediators made the announcement Wednesday in Managua. Luis Ángel Rosadilla, a special envoy to Nicaragua from the Organization of American States, told reporters that Ortega's government would release within 90 days "all the people detained and imprisoned in the context" of the protests. Reports put the total number of people who have been detained in the year since last April's protests began at more than 700, while at least 325 people have been killed and thousands injured in government crackdowns on protesters. The opposition had demanded the release of protesters before continuing talks. Ortega's government is in turn asking for U.S. and European Union sanctions on the country be lifted, according to the BBC. The U.S. has imposed sanctions on Nicaraguan officials including Ortega's wife, Vice President Rosario Murillo. U.S. national security adviser John Bolton reiterated Wednesday that the U.S. had sanctioned the Nicaraguan oil company Albanisa. "Efforts by Ortega and his cronies to evade these sanctions will fail," Bolton wrote. Opposition activists and Ortega's government started talks at the end of February for the first time since the summer of 2018. But after security forces broke up protests over the weekend and detained more than 100 people, the opposition group Civic Alliance halted talks Monday, saying "dialogue must produce results." Demonstrations began last spring initially over cuts to pension benefits but spread into general protests against Ortega's government. Ortega has been in office since 2007 and led the country previously in the 1980s. He has rejected the opposition's call to move up elections, saying he will serve his full current term until 2021. After Ortega expelled international human rights observers in December, the OAS said the government was moving further "into the terrain of authoritarianism."